Saint Quirinus of Neuss (German: Quirin, Quirinus), sometimes called Quirinus of Rome (which is the name shared by another martyr) is venerated as a martyr and saint of the Catholic and Eastern Orthodox churches. According to the Catholic Encyclopedia, a Roman martyr named Quirinus was buried in the Catacomb of Prætextatus on the Via Appia. The Martyrologium Hieronymianum (ed. De Rossi-Duchesne, 52) mentions Quirinus' name and place of burial. The Itineraries to the graves of the Roman martyrs (Giovanni Battista De Rossi, "Roma sotterranea", I, 180-1) also mention these two pieces of information. Quirinus is introduced into the legendary Acts of Sts. Alexander and Balbina, where it is said he was a tribune (Dufourcq, loc. cit., 175). He is said to have been decapitated in 116. Legends make him a Roman tribune who was ordered with executing Alexander, Eventius, and Theodolus, who had been arrested by order of Trajan. Quirinus converted to Christianity, however, after witnessing miracles performed by these three saints, and he was baptized along with his daughter Balbina. He was then martyred on March 30 by being decapitated and was then buried catacomb of Prætextatus on the Via Appia. According to a document from Cologne dating from 1485, Quirinus' body was donated in 1050 by Pope Leo IX to an abbess of Neuss named Gepa (who is called a sister of the pope). In this way the relics came to the Romanesque Church of St. Quirinus at Neuss (Quirinus-Münster) which still exists. A statue of Quirinus sits atop the church (which Jean-Baptiste Bernadotte attempted to plunder during the Napoleonic Wars). 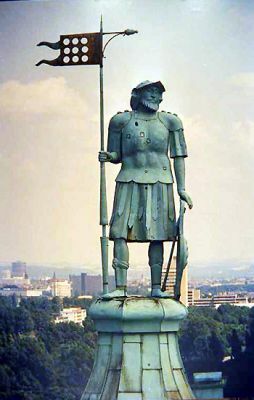 Inhabitants of that city invoked him for aid during Siege of Neuss by Charles the Bold that occurred in 1474-5. His cult spread to Cologne, Alsace, Scandinavia, western Germany, the Netherlands, and Italy, where he became the patron saint of Correggio. 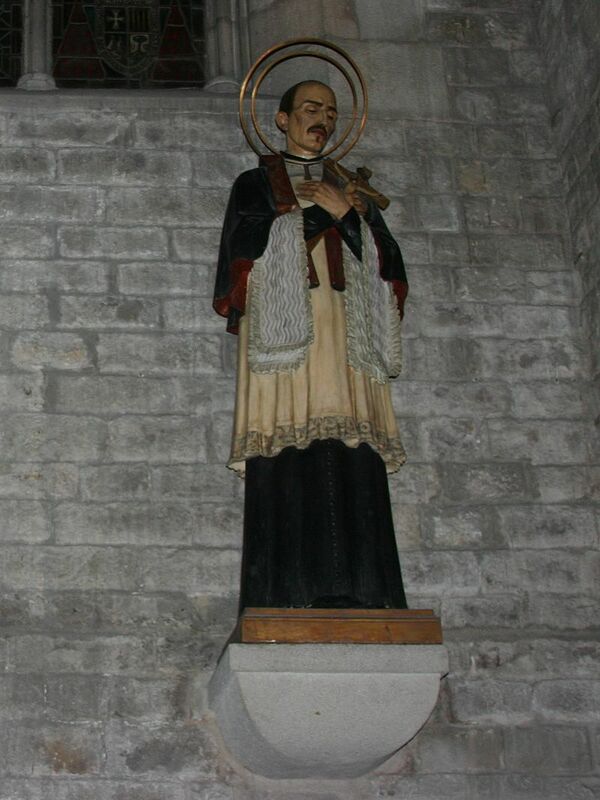 Numerous wells and springs were dedicated to him, and he was invoked against the bubonic plague, smallpox, and gout; he was also considered a patron saint of animals. Pilgrims to Neuss sought the Quirinuswasser (Quirinus water) from the Quirinusbrunnen (Quirinus spring or pump-room). A farmers' saying associated with Quirinus' feast day of March 30 was "Wie der Quirin, so der Sommer" ("As St. Quirinus' Day goes, so will the summer"). Quirinus, along with Hubertus, Cornelius and Anthony, was venerated as one of the Four Holy Marshals ('Vier Marschälle Gottes) in the Rhineland. Portraits of Quirinus and of St. Valentine appear at the top of the recto of the Nuremberg Chronicles (Folio CXXII [Geneva]). Ok...Saint Patrick's feast day is March 17. But I figured it might be good to learn about something more than shamrocks and green beer. 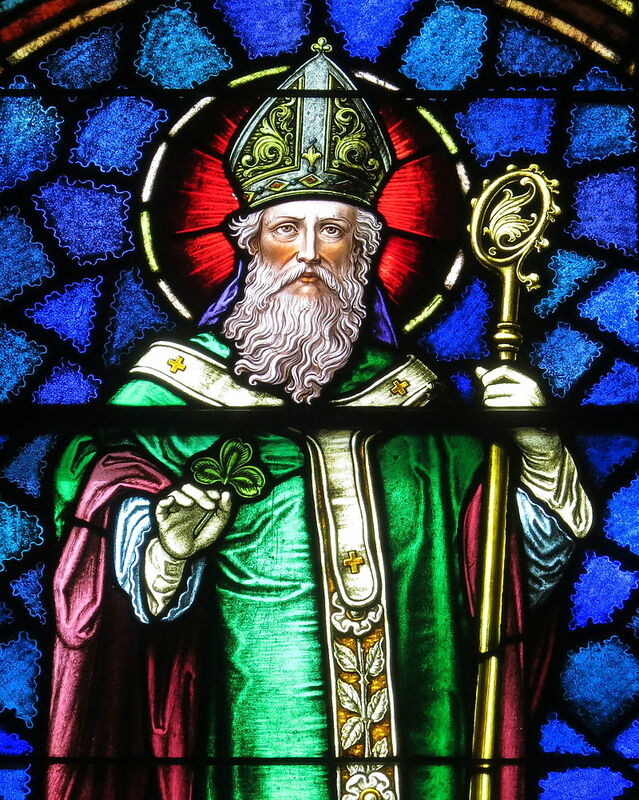 Legend credits Patrick with teaching the Irish about the doctrine of the Holy Trinity by showing people the shamrock, a three-leafed plant, using it to illustrate the Christian teaching of three persons in one God. The shamrock has since become a central symbol for Saint Patrick's Day. 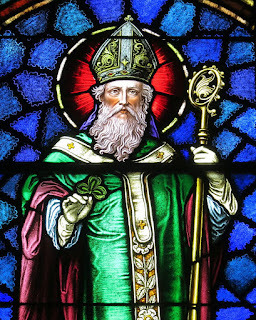 Saint Patrick (c. 386 – 461) (Latin: Patricius; Irish: Pádraig [ˈpˠaːd̪ˠɾˠəɟ]; Welsh: Padrig) was a fifth-century Romano-British Christian missionary and bishop in Ireland. Known as the "Apostle of Ireland", he is the primary patron saint of Ireland, the other patron saints being Brigit of Kildare and Columba. He is venerated in the Roman Catholic Church, the Anglican Communion, the Lutheran Churches, and in the Eastern Orthodox Church as equal-to-the-apostles and Enlightener of Ireland. According to the Confessio of Patrick, when he was about 16, he was captured by Irish pirates from his home in Britain and taken as a slave to Ireland, looking after animals; he lived there for six years before escaping and returning to his family. After becoming a cleric, he returned to northern and western Ireland. In later life, he served as a bishop, but little is known about the places where he worked. By the seventh century, he had already come to be revered as the patron saint of Ireland. Patrick was born in Roman Britain. Calpurnius, his father, was a decurion and deacon, his grandfather Potitus a priest, from Banna Venta Berniae, a location otherwise unknown, though identified in one tradition as Glannoventa, modern Ravenglass in Cumbria, in what is now England; claims have been advanced for locations in both present-day Scotland and Wales. Patrick, however, was not an active believer. According to the Confession of Saint Patrick, at the age of sixteen he was captured by a group of Irish pirates. They took him to Ireland where he was enslaved and held captive for six years. Patrick writes in the Confession that the time he spent in captivity was critical to his spiritual development. He explains that the Lord had mercy on his youth and ignorance, and afforded him the opportunity to be forgiven his sins and convert to Christianity. While in captivity, he worked as a shepherd and strengthened his relationship with God through prayer, eventually leading him to convert to Christianity. After six years of captivity he heard a voice telling him that he would soon go home, and then that his ship was ready. Fleeing his master, he travelled to a port, two hundred miles away, where he found a ship and with difficulty persuaded the captain to take him. After three days' sailing, they landed, presumably in Britain, and apparently all left the ship, walking for 28 days in a "wilderness" and becoming faint from hunger. After Patrick prayed for sustenance, they encountered a herd of wild boar; since this was shortly after Patrick had urged them to put their faith in God, his prestige in the group was greatly increased. After various adventures, he returned home to his family, now in his early twenties. After returning home to Britain, Patrick continued to study Christianity. A.B.E. Hood suggests that the Victoricus of St. Patrick's vision may be identified with Saint Victricius, bishop of Rouen in the late fourth century, who had visited Britain in an official capacity in 396. However, Ludwig Bieler disagrees. He studied in Europe principally at Auxerre, but is thought to have visited the Marmoutier Abbey, Tours and to have received the tonsure at Lérins Abbey. Saint Germanus of Auxerre, a bishop of the Western Church, ordained him to the priesthood. Acting on his vision, Patrick returned to Ireland as a Christian missionary. According to J. B. Bury, his landing place was Wicklow, Co. Wicklow, at the mouth of the river Inver-dea, which is now called the Vartry. Bury suggests that Wicklow was also the port through which Patrick made his escape after his six years' captivity, though he offers only circumstantial evidence to support this. Tradition has it that Patrick was not welcomed by the locals and was forced to leave and seek a more welcoming landing place further north. He rested for some days at the islands off the Skerries coast, one of which still retains the name of Inis-Patrick. The first sanctuary dedicated by Patrick was at Saul. Shortly thereafter Benin (or Benignus), son of the chieftain Secsnen, joined Patrick's group. Never before did they know of God except to serve idols and unclean things. But now, they have become the people of the Lord, and are called children of God. The sons and daughters of the leaders of the Irish are seen to be monks and virgins of Christ! Patrick's position as a foreigner in Ireland was not an easy one. His refusal to accept gifts from kings placed him outside the normal ties of kinship, fosterage and affinity. Legally he was without protection, and he says that he was on one occasion beaten, robbed of all he had, and put in chains, perhaps awaiting execution. Patrick says that he was also "many years later" a captive for 60 days, without giving details. After years of living in poverty, traveling and enduring much suffering he died March 17, 461. He died at Saul, where he had built the first Irish church. He is believed to be buried in Down Cathedral, Downpatrick. In my first treasure hunt book, Seek and Ye Shall Find, I mentioned the time I spent studying in London, England in 1993 as part of an MSU study abroad program. Recently, thanks to a family outing, I've been reminiscing quite a bit about it. It's amazing to realize that 26 years ago, at this time, I was residing in that mesmerizing city. Last Saturday, my family and I went to a local "pub" call Bud & Stanley's (best burgers in Grand Rapids, IMO). Their sign said they'll be having live Irish music on March 17 (St. Patrick's Day). Inspired by the thought of listening to live Irish music in a pub again, I recalled my Friday night ritual from another life. It was 1993. The internet was in its infancy and mobile phones were still attached to cars. About a dozen of us from Michigan State University ventured over to London to participate in an MSU study abroad program. No electronic devices (except for a shoulder held video camera and a 35mm film point and shoot camera). We took up residency in a three story flat on Kilburn Park Road that MSU had arranged for us. Our professors lectured in our living room every day. Those were the days. To find out what was going on in London (remember: we didn't have the internet), we'd pick up an issue of Time Out London, a weekly magazine that had all the goings on around London. That's where we saw a listing for live Irish music at the Victoria pub every Friday night. Looking it up now, I can see after numerous name changes throughout the years, it's again the Victoria Tavern and it looks a lot different, both inside and out. Click here for a Google street view - change the dates to see some of the more recent iterations. In a way, it makes me kind of sad to see the "old" pub feel may be lost in that special place. 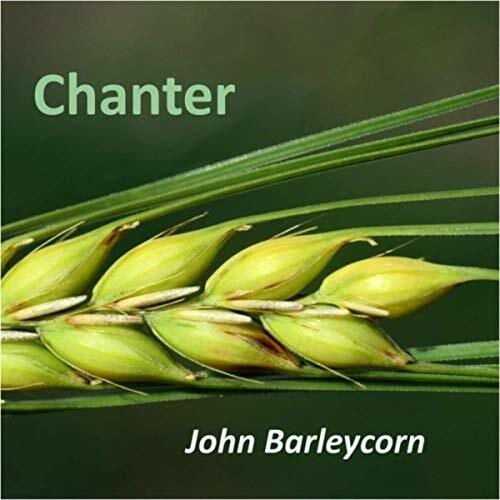 The band was called Chanter. We went and had a blast. It was dark, dingy and smoky, yet somehow perfect. The music was loud and good. We'd get there early so we could claim a table right up front. Chanter were fun. Great singing, great energy. Some humor thrown in. They had a good time while we had a good time. Fiddlyoory-oory-Ay, Fiddlyoory-oory-Ay, Fiddlyoory-oory-Ay to work upon the railway. "And he's building a railway to Heaven"
It was kind of one of those wait for it, wait for it moments that was great every time. As the evening wrapped up, on our walk to the Holloway Road tube (subway) station, we'd stop by a local fish & chips shop to buy some chips (french fries), wrapped in newspaper (without the print) and covered with malt vinegar. That little treat made the 30 minute journey underground much more enjoyable. After going to the Victoria almost every weekend for about 2 months the brevity of our time in London became a reality. To capture the memories, we asked if we could record the show one evening. We were pleasantly surprised when the band agreed. So there I stood for roughly two hours with that giant video camera on my shoulder. Kids these days, with their cell phones, will never understand the struggles. They released an album last year. You can listen to samples and buy it on Amazon or other music download sites. They also have a website, through which I sent a moderately lamenting and mostly reminiscing email to them. I received a nice, sincere and humorous response from Roddy Rogers (one of the members of Chanter who also has some solo albums). Really, do yourself a favor and buy their new album John Barleycorn. 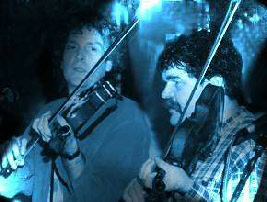 You won't regret it (especially if you like some mad fiddling). John Barleycorn is a new album from celtic band Chanter. The band is celebrating 40 years of live performances and recordings, and has chosen to record a range of mainly traditional songs from its back catalogue. The core of the band, Malcolm and Roddy Rogers, have been joined across the years by a cast of brilliant musicians, ranging from the great tinwhistle playing by Brian Aldwinckle to the stellar drumming of Hughie Flint (of McGuiness-Flint and John Mayall's Bluesbreakers fame) and Mickey Waller (of Jeff Beck/Rod Stewart fame!). This album has set out, and hopefully succeeded (you judge! ), in faithfully reproducing some of the best arrangements of traditional material we've played over the years. Recorded by Roddy Rogers, Malcolm Rogers and Steno Vitale, the album features vocals, guitars, fiddles, mandola, keyboards and drums - kit, bodhran and djembe. For Chanter's original material, in the same genre, please see 'The Journey' on Chanter's own website, and also look for Roddy Rogers on CD Baby and the usual downloading and streaming services. From Latin, feminine of quadragesimus meaning fortieth. First off, Lent. The word "lent" comes from Middle English "lente" meaning springtime. The rest of the world uses a Latin-derived word like "Quadragesima". So, to get to the core of it, let's explore Quadragesima. Quadragesima denotes a season of preparation by fasting and prayer, to imitate the example of Christ (Matthew 4). Several such seasons were observed by the early Christians (for example, leading up to Christmas and Easter). The Greeks had four, the Maronites six, and the Armenians eight. The major, before Easter, is commonly known. It is mentioned in the fifth canon of the Council of Nicæa (325 AD), in the sixty-ninth of the Apostolic Canons (around 500 AD), and in the Pilgrimage of Ætheria (380 AD; this narrative of a Christian pilgrimage is the earliest such text which survives to us. It is an important source of information about early Christian practices. Listen to the free audio book). Today's Lenten practice, specifically, is not spelled out in the Bible. However, in the Bible we do find many occurrences of being instructed to follow the teachings and traditions of the apostles and their successors. Paul tells the Corinthians, “I commend you because you remember me in everything and maintain the traditions even as I have delivered them to you” (1 Cor. 11:2), and he commands the Thessalonians, “So then, brethren, stand firm and hold to the traditions which you were taught by us, either by word of mouth or by letter” (2 Thess. 2:15). Further on he says, “Now we command you, brethren, in the name of our Lord Jesus Christ, that you keep away from any brother who is living in idleness and not in accord with the tradition that you received from us” (2 Thess. 3:6). To make sure that the apostolic tradition would be passed down after the deaths of the apostles, Paul told Timothy, “[W]hat you have heard from me before many witnesses entrust to faithful men who will be able to teach others also” (2 Tim. 2:2). Some of those "others" are often referred to as the Church Fathers, successors of the apostles who continued the apostolic traditions and taught new ones, in line with Scripture, in order to address issues and cultural challenges as they emerged. The Holy Spirit, the advocate, guides successors of the apostles as promised by Jesus. Following are quotes from some of these Church Fathers during an era when unity, for which Jesus prayed, was maintained. When her mother-in-law died, Frances became mistress of the household. During a time of flood and famine, she turned part of the family's country estate into a hospital and distributed food and clothing to the poor. According to one account, her father-in-law was so angry that he took away from her the keys to the supply rooms; but gave them back when he saw that the corn bin and wine barrel were replenished after Frances finished praying. During the wars between the pope in Rome and various anti-popes in the Western Schism of the Catholic Church, Lorenzo served the former. According to one story, their son Battista was to be delivered as a hostage to the commander of the Neapolitan troops. Obeying this order on the command of her spiritual director, Frances took her son to the Campidoglio. On the way, she stopped in the Church of the Aracoeli located there and entrusted her son's life to the Blessed Mother. When they arrived at the appointed site, the soldiers tried to put her son on a horse to transport him to captivity. However, the horse refused to move despite heavy whipping. The superstitious soldiers saw the hand of God in this and returned the boy to his mother. During a period of forced exile, much of Lorenzo's property and possessions were destroyed. In the course of one occupation of Rome by Neapolitan forces in the early part of the century, he was wounded so severely that he never fully recovered. Frances nursed him throughout the rest of his life. Frances experienced other sorrows during her marriage to Lorenzo. They lost two children to the plague. Chaos ruled the city in that period of neglect by the pope and the ongoing warfare between him and the various forces competing for power on the Italian peninsula devastated the city. The city of Rome was largely in ruins, and wolves were known to enter the streets. Frances again opened her home as a hospital and drove her wagon through the countryside to collect wood for fire and herbs for medicine. It is said she had the gift of healing, and over 60 cases were attested to during the canonization proceedings. According to the Catholic Encyclopedia, "With her husband's consent St. Frances practiced continence, and advanced in a life of contemplation. Her visions often assumed the form of drama enacted for her by heavenly personages. She had the gift of miracles and ecstasy, as well as the bodily vision of her guardian angel, had revelations concerning Purgatory and Hell, and foretold the ending of the Western Schism. She could read the secrets of consciences and detect plots of diabolical origin. She was remarkable for her humility and detachment, her obedience and patience". In March 1433 she founded a monastery at Tor de' Specchi, near the Campidoglio, in order to allow for a common life by those members of the confraternity who felt so called. This monastery remains the only house of the Institute. That July 4, they received the approval of Pope Eugene IV as a religious congregation of oblates with private religious vows. The community later became known simply as the Oblates of St. Frances of Rome. On May 9, 1608, she was canonized by Pope Paul V, and in the following decades a diligent search was made for her remains, which had been hidden due to the troubled times in which she lived. Her body was found incorrupt some months after her death. 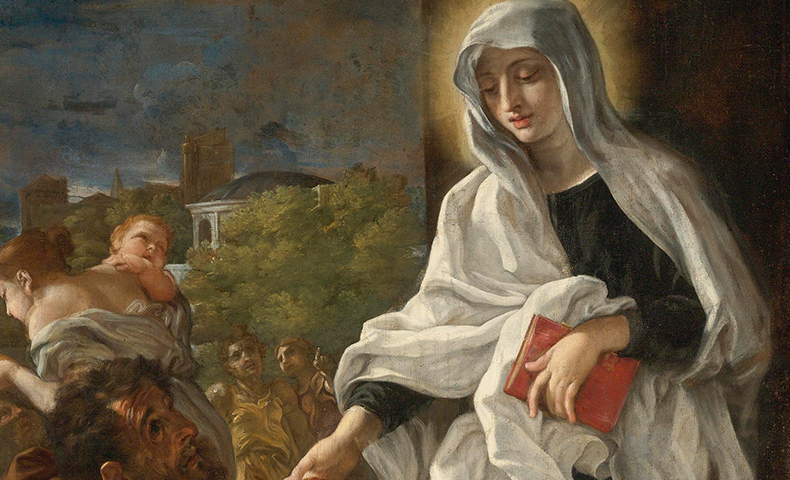 Her grave was identified on April 2, 1638, (but this time only the bones remained), and her remains were reburied in the Church of Santa Maria Nova on March 9, 1649, which since then has been her feast day. Again, in 1869, her body was exhumed and has since then been displayed in a glass coffin for the veneration of the faithful. The Church of Santa Maria Nova is now usually referred to as the Church of St. Frances. Examples of the practice among Jews are found in several other books of the Bible, including Numbers 19:9, 19:17, Jonah 3:6, Esther 4:1, and Hebrews 9:13. Jesus is quoted as speaking of the practice in Matthew 11:21 and Luke 10:13: "If the mighty works done in you had been done in Tyre and Sidon, they would have repented long ago (sitting) in sackcloth and ashes." Christians have continued the practice of using ashes as an external sign of repentance. Tertullian (c. 160 – c. 225) said that confession of sin should be accompanied by lying in sackcloth and ashes. The historian Eusebius (c. 260/265 – 339/340) recounts how a repentant apostate covered himself with ashes when begging Pope Zephyrinus to readmit him to communion. Ash Wednesday is a Christian holy day of prayer, fasting, and repentance. It is preceded by Shrove Tuesday and falls on the first day of Lent, the six weeks of penitence before Easter. In the Catholic Church, Ash Wednesday is observed by fasting, abstinence from meat, and repentance – a day of contemplating one's transgressions. On Ash Wednesday and Good Friday, Catholics between the ages of 18 and 59 (whose health enables them to do so) are permitted to consume one full meal, along with two smaller meals, which together should not equal the full meal. Some Catholics will go beyond the minimum obligations put forth by the Church and undertake a complete fast or a bread and water fast until sunset. Ash Wednesday and Good Friday are also days of abstinence from meat (mammals and fowl), as are all Fridays during Lent (which is why you see all those Friday fish specials at restaurants). Some Catholics continue fasting throughout Lent, as was the Church's traditional requirement, concluding only after the celebration of the Easter Vigil. Various manners of placing the ashes on worshippers' heads are in use within the Roman Rite of the Catholic Church, the two most common being to use the ashes to make a cross on the forehead and sprinkling the ashes over the crown of the head. Originally, the ashes were strewn over men's heads, but, probably because women had their heads covered in church, were placed on the foreheads of women. In the Catholic Church the manner of imposing ashes depends largely on local custom, since no fixed rule has been laid down. Although the account of Ælfric of Eynsham shows that in about the year 1000 the ashes were "strewn" on the head, the marking of the forehead is the method that now prevails in English-speaking countries. In its ritual of "Blessing of Ashes", this states that "the ashes are blessed at the beginning of the Eucharist; and after they have been blessed they are placed on the forehead of the clergy and people." On Ash Wednesday, the Pope, who is the Bishop of Rome, traditionally takes part in a penitential procession from the Church of Saint Anselm to the Basilica of Santa Sabina, where, in accordance with the custom in Italy and many other countries, ashes are sprinkled on his head, not smudged on his forehead, and he places ashes on the heads of others in the same way. 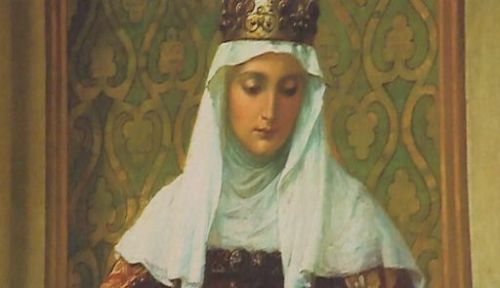 Agnes of Bohemia, O.S.C., (Czech: Svatá Anežka Česká, 20 June 1211 – 2 March 1282), also known as Agnes of Prague, was a medieval Bohemian princess who opted for a life of charity, mortification of the flesh and piety over a life of luxury and comfort. Although she was venerated soon after her death, Agnes was not beatified or canonized for over 700 years. Agnes was the daughter of King Ottokar I of Bohemia, making her a descendant of Saint Ludmila and Saint Wenceslaus, patron saints of Bohemia. 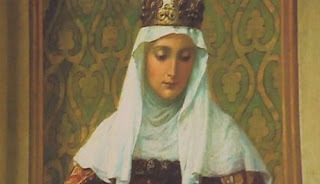 Agnes' mother was Constance of Hungary, who was the sister of King Andrew II of Hungary, so Agnes was a first cousin to St. Elizabeth of Hungary. When she was three years old, Agnes was entrusted to the care of St. Hedwig of Andechs, the wife of Duke Henry I the Bearded of Silesia. Hedwig placed her to be educated by a community of Cistercian nuns in a monastery which she herself had founded in Trzebnica. Upon her return to Prague, Agnes was entrusted to a priory of Premonstratensian Canonesses to continue her education. At the age of eight, Agnes was betrothed to Henry, son of the Emperor Frederick II, Holy Roman Emperor. Henry was ten years old and had just been crowned King of Germany. According to custom, Agnes should have spent her childhood at her future husband's court. Emperor Frederick, King of Sicily, had his court in Palermo, but his son Henry, King of Germany, lived in Germany at the palace of Archbishop Engelbert in Cologne. Agnes was sent to the court of Duke Leopold VI of Babenberg. Leopold, however, wanted the young Henry to marry his own daughter, Margaret. After being betrothed for six years, Henry and Agnes's betrothal contract was cancelled. Like other noble women of her time, Agnes was a valuable political pawn. In 1226, Agnes's father Ottokar went to war against the Babenbergs as a result of the cancelled betrothal. Ottokar then planned for Agnes to marry Henry III of England, but this was vetoed by the Emperor, who wanted to marry Agnes himself. Agnes refused to play any more part in a politically arranged marriage. She decided to devote her life to prayer and spiritual works, for which she sought the help of Pope Gregory IX. Emperor Frederick is said to have remarked: "If she had left me for a mortal man, I would have taken vengeance with the sword, but I cannot take offence because in preference to me she has chosen the King of Heaven." On land donated by her brother, Wenceslaus I, King of Bohemia, she founded the Hospital of St. Francis (circa 1232-33) and two friaries for the Franciscan friars, who had just come to Bohemia at her brother's invitation. Through them, Agnes learned of Clare of Assisi and her Order of Poor Ladies, the monastic counterpart of the friars. She began a correspondence with Clare (which lasted for over two decades), which led to Clare's sending five nuns from the monastery in Assisi to Prague to begin a new house of the order. This was the first Poor Clare community north of the Alps. Agnes built a monastery and friary complex attached to the hospital. It housed the Franciscan friars and the Poor Clare nuns who worked at the hospital. This religious complex was one of the first Gothic buildings in Prague. In 1235, Agnes gave the property of the Teutonic Knights in Bohemia to the hospital. She herself became a member of the Franciscan Poor Clares in 1236. As a nun, she cooked for and mended the clothes of lepers and paupers, even after becoming abbess of the Prague Clares the following year. As can be seen in their correspondence, Clare wrote with deep maternal feelings toward Agnes, though they never met. A lay group working at the hospital was organized by Agnes in 1238 as a new military order, dedicated primarily to nursing, known as the Knights of the Cross with the Red Star, following the Rule of St. Augustine. That next year, Agnes handed over all authority over the hospital she had founded to these monastic knights. They were recognized as an order by Pope Gregory IX in 1236-37. Agnes lived out her life in the cloister, leading the monastery as abbess, until her death on 2 March 1282. In 1874, Pope Pius IX had Agnes beatified. Pope John Paul II canonized Blessed Agnes 12 November 1989. While she was known by her contemporaries because of her supposed visions and healing, such as her prophecy that King Wenceslaus would be victorious in his battle against the Austrians, her canonization was based on her practice of the Christian virtues of faith, hope and charity to an extraordinary degree, and the Church's view is confirmed either through a miracle granted by God in answer to the saint's prayers, or as in this case, by the continuing devotion of the Christian faithful to a saint's example across centuries. Though Agnes died in 1282, she was still venerated by Christians around the world more than 700 years later. She was honored in 2011, the 800th anniversary of her birth, as the Saint of the Overthrow of Communism, with a year dedicated to her by Catholics in the Czech Republic.